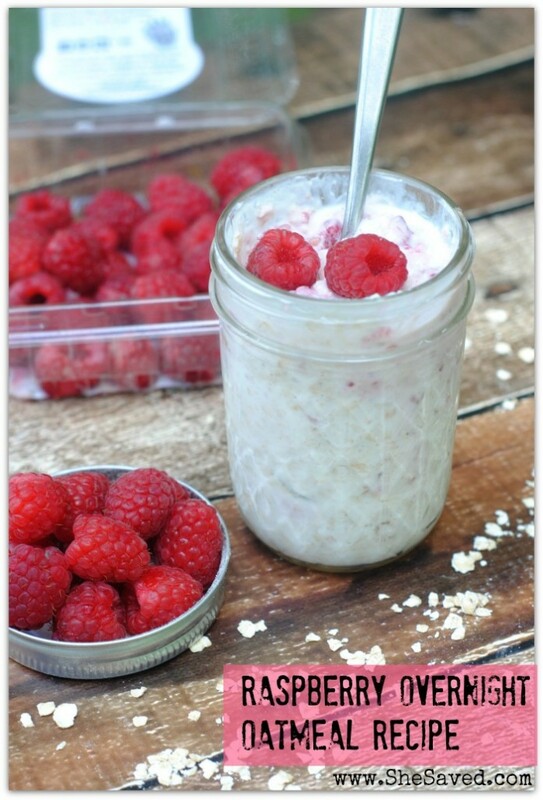 If you are looking for a fun and easy (and delicious) breakfast option, then you will love this Raspberry Overnight Oatmeal Recipe! It is easy to make and you will be so happy that you did it the night before, because it makes mornings a breeze! This is a wonderful cold breakfast option for summer mornings, especially if you get the kind of warm mornings that we do here in Idaho. I usually set it out for about 5 minutes before serving/eating which takes a bit of the chill out of it. Add the oatmeal, Greek yogurt, honey and milk to the 8 oz. jelly jar. Put the lid on and shake well to mix all the ingredients. When you’re done shaking, remove the lid and add the fresh raspberries. Replace the lid and refrigerate overnight. Enjoy cold in the morning. 1 8oz. jelly jar = 1 serving. 12 tbs of honey seems like a lot, is that correct? Also, could this be heated up in the morning or do you eat it cold? Sounds great! Thanks! Good morning Gail! Thank you so much for catching that! It is actually 1-2 tbs, 12 would be WAY too much, lol. We like to eat it cold but I do let it sit about 5 minutes to take the chill out. I am sure you could heat it, I am just not sure what that would taste like. Our mornings are really warm here in Idaho in the middle of the summer, so it's a nice refreshing breakfast. Let me know what you think! Can you make them for the week or will it get too soggy. I think they might get too soggy, ours haven't lasted that long, lol!